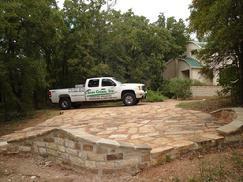 The Clean Green Inc. Company, offer the finest and quality stone supplies in north Dallas Fort worth area. Stone work contractor, Install new hardscapes and Outdoor living. You can have them: Don't be afraid to think big! We can handle and offer the following services; Outdoor living, patios, retaining walls, landscapes, hardscapes, stairs, pathways, flowerbeds, decks, water falls, play grounds, drainage solution and most the important erosion control. Remember; A good drainage keeps water running its best. We 're local and close to you; We can build any size of patios with retaining walls help us to create levels to the new landscapes and hardscapes. Thank you for selecting Clean Green, Inc. for your flagstone patio or landscape contractor project! We are certified to meet state of Texas & local codes for irrigation install and sprinkler repairs. We can assist you with landscape lighting installation techniques, wiring for lighting system. We can build custom water fall sounds, waterfall cascade, water fall fountains, creek cascading, and many ways to build a back yard water water features. We can design hardscapes, build or install flagstone patios, masonry repairs, paver replacement, brick or stone mailboxes build, stone work installation, stepstone install, Retaining wall and water falls, landscape lighting etc. Good irrigation sprinkler coverage It's essential for your turf. We can updating, replacement, service, repair any problem and maintain your existing landscape. if you are interested in new installation of irrigation or landscape, you are in the right place. 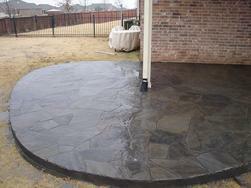 Tell us about your Flagstone or pavers patio install or repairs needs! New hardscape and landscape with natural flagstone patio, stone border, trees and shrubs. We can build and/or install flagstone patios, stone borders, planters and water features for you in front or back yard. 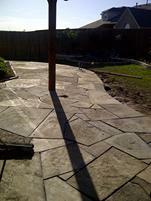 Aubrey, Prosper, Frisco, Denton flagstone, paver, decomposed granite patio work installation and repairs. 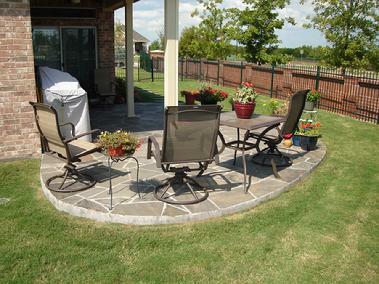 A natural flag stone patio can transform any yard into beautiful, outdoor living space. Pavers patio the best and easy way to give a beautiful look to any size yard. 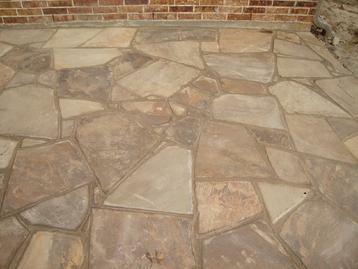 A classic natural flagstone patio! 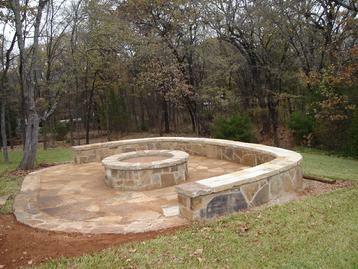 Fire pit and flagstone patio! Discover the outdoor living you need at a price you can afford. The best patio at the best prices anywhere! IF you looking for the hardscape and/or landscape maintenance you need at a price you can afford? We can Build, Install luxury and rustic patios and/or Repairs Flagstone Patios of Natural Stone, Pavers and we know the solutions can help you. Call us today to see how affordable it can be. Casual outdoor living, local and/or near to you - Family owned and operated since year 2004 and we had delivery great service! Patio and water features provide homeowners to enjoy their outdoor living space.